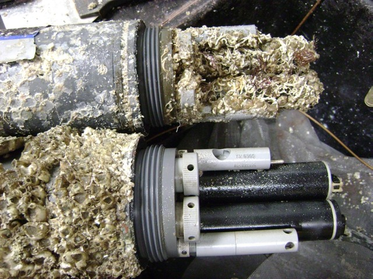 The most powerful anti-fouling (micro-fouling and macro-fouling) system in the market - "no gimmicks"
With the LDM, you can now deploy a multiprobes in a discharge area where bubbling water would normally affect the sensors operation. Here is what you should expect from the LDM: Two multiprobes were deployed side by side in an active water body for 6 weeks . One of them was equipped with the HydroTech LDM but not the other. See graphed data below. 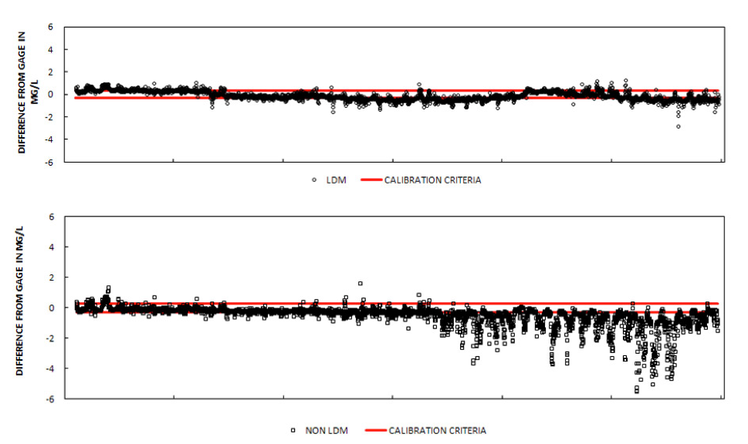 Optical DO: The LDM equipped multiprobe DO measurements are stable and accurate during the whole 6 weeks while the DO measurements from the other multiprobe without LDM are erratic and drift out of the calibration criteria just after 3 weeks. Conductivity: After 2.5 weeks of deployments fouling has already affected the conductivity measurements on the unit without LDM. While the LDM equipped multiprobe is still collecting stable and more accurate measurements. 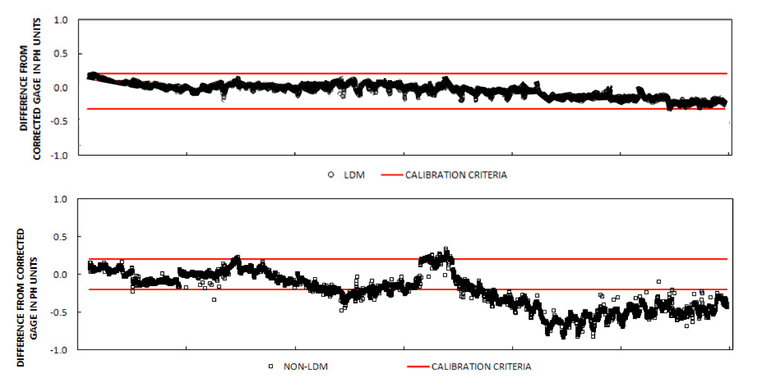 Temperature: The LDM equipped multiprobe shows less sporadic temperature measurements. Sporadic temperature measurement affects data from all other sensors since they're temperature compensated. Can be deployed to 20 degree angle from ground surface. Q: Can the LDM be used with any multiprobe? A: Yes. The LDM is designed to work with any multiprobe from any manufacturer. The sample housing is multiprobe specific but it's field replaceable. Q: Does the LDM require external power? A: Yes. The LDM requires a 12 Volt external power source. Q: Does the LDM operate with data-loggers like Sutron and Handar? A: Yes. The LDM can communicate to any data logger that uses SDI-12 or RS232 communication protocols. Q: Can the LDM operate in waters with high sediments ? Q: Can the LDM be deployed at an angle ? A: Yes, the LDM can be deployed up to a 20 Degree angle from the ground surface. Q: What is the maximum depth deployment for the LDM? Q: What is the minimum depth deployment for the LDM? Q: How does the LDM work? Phase 1: Filling the sample housing. This is accomplished by opening a valve for a set duration inside the LDM. The hydrostatic pressure allows the water to flow via the intake through the valve then fill the sample housing. Phase 2: Holding the water in the sample housing. The valve is closed and the water inside the sample housing is held for set duration. Phase 3: Emptying the sample housing. The pump turns on and pumps the water from the sample housing through the side tube to the surface. Q: What is the dual tube on the side of the LDM used for? A: One tube is used to vent the sample housing to the surface which allows the sample housing to fill using hydrostatic pressure only. The other tube is used to evacuate the water from the sample housing to the surface for data validation at the surface if neede. Q: What materials are used in the LDM ? A:All housings are built with Grey PVC. The cable jacket is Polyurethane, the connectors are 3/16 stainless steel . Q: Can the LDM be used in fresh and salt water? Q: Are the LDM connectors waterproof? A: The LDM under water connector is 100 % waterproof and designed to stay under water continuously. The DB9 surface connector is watertight only and cannot be submerged under water.